Some soon to be married couples take wedding invitations for granted considering it as an added cost to their ceremonial budget. In my own perspective this small piece of paper plays a very significant role as it will give your guests an insight into what the nuptial will be. You can learn to make wedding invitations with these online classes. Handing out printed invites to your friends and relatives will let them feel that you want them to become a part of this substantial event in your life. There are a lot of wedding invitations to choose from which are available in the market today. 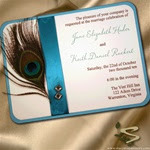 I find the Peacock wedding invitation elegant. It offers a special meaning. It demonstrates a classy and more formal kind of ritual. It is more often used in Royal and extravagant weddings showing a flashy showcase of personality. The type and style of an invitation depends on the budget and the theme. 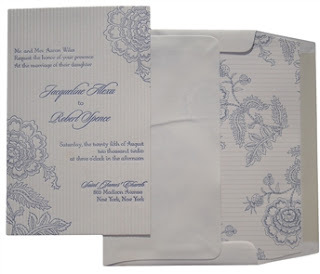 You may also opt for a flexible digital printing where you can choose from a variety of designs and colors from the collection of Luxury Wedding Invitations that will fit, match and reflect your lifestyle, personality, as well as the theme. You may perhaps consider whether you decide on a formal or a simple informal invitation with or without a separate RSVP card. One essential tip to remember is that the card must achieve a first good impression. It will also look impressive, unique and sophisticated if you can personalize or customize the wordings on your own. Beautiful designs! I also like those invitation in shimmery paper with only the initials of the couple and maybe two love birds or butterflies. I think the simpler it is, the more elegant it becomes. A friend of mine is getting married and we've been scouting the best stuff around....not just invitations but all else....kastress!